Twitter is an amazing… media? Social network? Means for ultra-fast transfer of news, wisdom, stupid things and “important” things like “I am drinking coffee now”? Something like IRC, but with an option for SMS, filtering, search, etc.? …where the consequences of discontinuing the work on the XHTML 2 standard, and what will happen with XHTML 1.0, HTML 4.01, as well as with the new HTML 5, were passionately discussed. 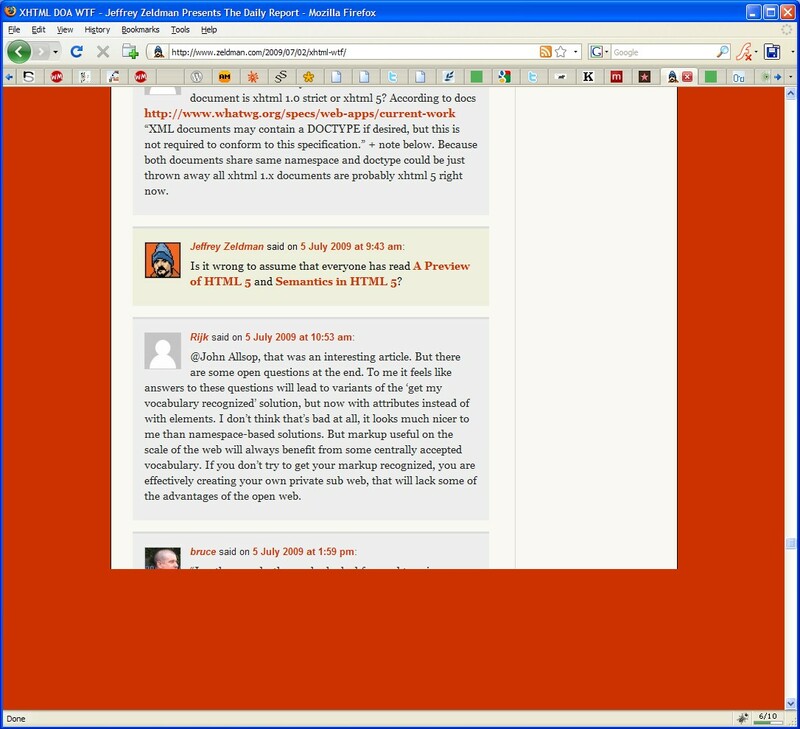 At some point, in the Zeldman’s website, a strange bug appeared (in Firefox 3/Win): somewhere around 3/4 of the page with his last post and the numerous comments below, the content suddenly was disappearing (screenshot). Without a reason. The page itself was validating perfectly and there were no problems with the encoding or the HTML/CSS code. Jeffrey noticed the problem, too, and was trying to solve it for quite a long time. The assumption that a problematic pingback with UTF-16 encoding was the culprit, was not confirmed. I tried to investigate, too, out of curiosity, without any positive results, though. Then I’ve spent some more time to test in detail if the change did not affect any other popular browser (Opera 9.6, Safari 4, Chrome 2, IE7, IE6) and finally, I wrote to Zeldman, proposing him the fix for Firefox. Unfortunately, the fix introduced a new bug — the background of the page was “flashing” for a second or two on each page load because overflow: visible caused the background of the element #wrapper to load with a little delay (before: overflow: auto). Ah, and finally, why did I start this blog post with the question, what exactly is Twitter? Because, after using Twitter for at least a few years, I can say that Twitter allows quick, precise communication in a new way. 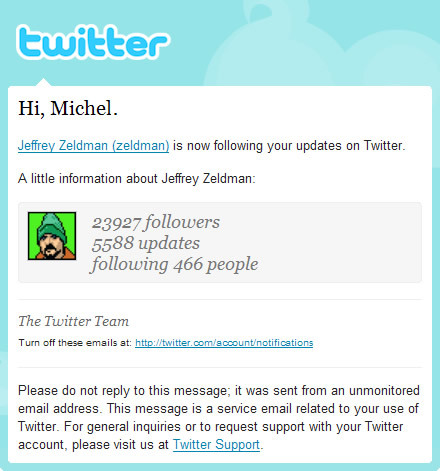 Comments in blogs, feedback forms, emails, allow us to communicate, too, but Twitter is something different. Something, which I cannot define precisely, but something, which fulfills its purpose and is also fun! I wrote recently about some very nice HTML icons which Veerle Pieters created and released for free. Unfortunately, the icons were in JPG format, which restricted their possible uses (they were also released in MacOS icon type, but this format cannot be used in the Web, obviously). If you are a Mac user (and Web designer), then you maybe use the Markup Validator S.A.C. — this app is a stand-alone version of the W3C Markup Validator. The new icons from Veerle could replace the default icon of this application in your MacOS X dock. Plus, she is releasing the icon set for free to the community!